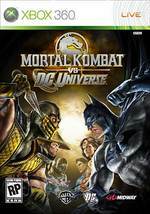 Today online video game rental company GameFly has updated their site with what, to us, appears to be the final box art for Mortal Kombat vs. DC Universe. It's similar to recent promotional materials we've seen circulating with Scorpion going head to head with Batman. 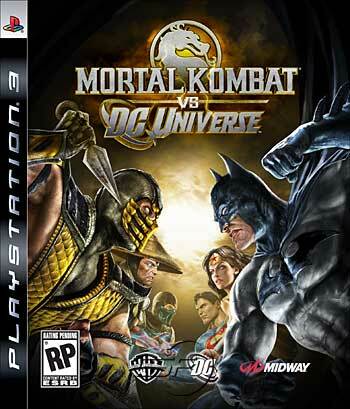 Except now Wonderman, Superman, Raiden and Sub-Zero join the fray to fill out the cover of the box. The only thing it's missing is it's final rating, which has yet to be determined by the ESRB. Gamestop has also unveiled the T-Shirt that will be included when pre-ordering the Kollector's Edition of the game. 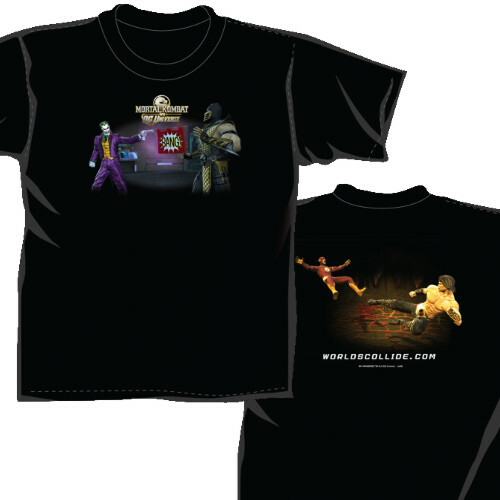 The front of it features a still shot of Joker's fatality, while the back shows Liu Kang giving a flying kick to The Flash. We previously thought this was to be included in all Kollector's Edition packages, but it appears it only will be available as a pre-order bonus either online or in store. Thanks to contributor TheAces for the tip! Damn it Pat, you beat me to it! LOLZ. I hope they are seriously sticking with this box design. i thought the box would look like the promo pic that we always see. you know, the one that has sub zero and batman lookin at each other. but yea im kinda glad they made a new one cuz its variety. Im not a fan of the box at all. It looks very cartoonish. I cant help but feel as if they are ranking the characters and little old superman is it back. And that shirt? Pretty crappy. Just changed my mind about reserving the game. I'll pickup the shirt on ebay for $1 after the game is release and save myself $9. I like the box art and the shirt. They're cool. Im not a fan of the box at all. It looks very cartoonish. I feel the same way. It's okay I guess, but it doesn't seem very representative of the actual game. 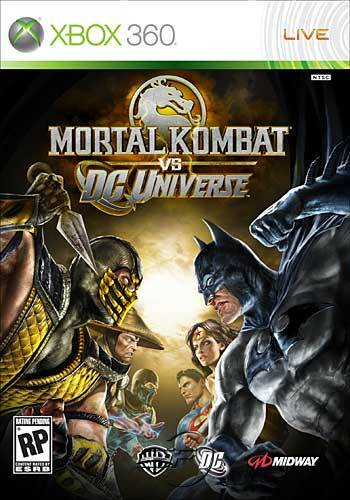 Also, why make Batman's cape and cowl blue on the cover when they're black in the game? It seems like there's other artwork we've already seen that would make a better cover than this. Yeah I don't like that boxart very much. A lot of games get different covers in the UK though I think, so might not be the one we get here. Does seem very cartoon/anime style which is a bit lame, especially because it doesn't even look that well drawn. Perfect 6 characters for the front cover IMO though so not all bad! I think i would have liked Raiden vs Superman as well. Something does not like right with Raiden and Wonder Woman. I love the concept for the cover....like the lines has been drawn. WAR TIME, lol. But I've always thought it should be Raiden vs Superman. Just noticed, what is with the RP rating? Is that just the default rating they put on promos or is there a slim chance of the M coming? No, it just hasnt been rated yet. And they dont rate the games until they play the final version. They stick "Rating Pending" on pretty much anything that hasn't been released yet, so yeah, it's basically just a default rating. Rating Pending means exactly what it means. The game hasn't come under review by the ESRB yet. Anyway, I love that box art. But I also love cartoons. The older MKs were also very cartoony. DC Comics characters have been in cartoons. I think it's a perfect fit. And, I'm wearing that shirt EVERYWHERE. I'm gonna get Kollector's Edition! I'm ok with the boxart. Not what I would have chose, but I'm not the one calling the shots. Usually games get better boxart in the UK or Japan. It's no fair. I love the boxart. Would have preferred a promo print on the T-shirt than just in-game screenshots that we have, but I'll still wear it. So glad I preordered from GS. Living in the UK, I doubt I'll ever see anyone with that same shirt. i love this shirt! i'm still sporting the game crazy deception shirt and i'm sure i will sport this one for years to come also! can i get a here here? Looks good and I can't wait to get that shirt. On Gamestop.com it says that you get the t-shirt when you pre-order the regular version, and a lithograph when you pre-order the collectors edition. Does anyone know if this is a mix up, or will I really have to buy the regular edition to get the t-shirt? That would be saddening...I like lithographs though. The one I got for Armageddon looks great and I still have it nice and tidy. Still, a T-shirt is easier to wear around school than a lithograph.